Horses with anhidrosis lack the ability to sweat. Sometimes, they start out capable of this normal bodily function, and then suddenly lose it. Horses of all breeds, ages, colors and genders are at risk. Also called drycoats or puffers, victims of anhidrosis are most often active horses who live in hot, humid climates. In a normal horse, two-thirds of the heat generated by exercise evaporates as sweat, while just 15 to 25 percent is lost through the respiratory system. However, the reason that some horses cannot sweat and must release excess heat by heavy breathing is unknown. One theory posits a decreased response to the hormone epinephrine, which normally stimulates sweat glands. Exercise in heat and humidity often triggers anhidrosis. However, more sedentary horses in warm climates can also be affected. Quarter horses, warmbloods and thoroughbreds are diagnosed with anihidrosis most often. Arabians hardly ever develop this problem. This suggests that genetics might contribute to the problem, making some breeds of horses more at risk than others. Affected horses can develop high heart rates, hyperthermia and exercise intolerance. Sometimes, anhidrosis develops gradually after horses have been moved to hot climates from more temperate ones. However, horses born in hot, humid areas can abruptly develop the disease, even though they sweat normally as foals. 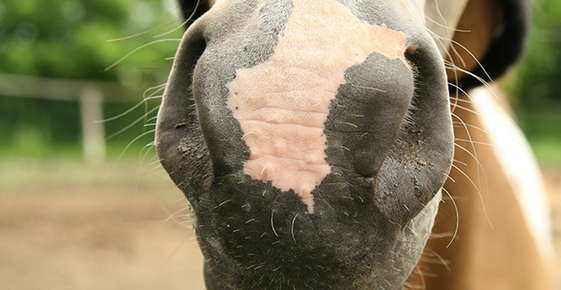 Veterinarians can be fairly certain a horse has anhidrosis based on clinical signs. However, to make a definitive diagnosis, a veterinarian will inject a small amount of epinephrine or the drug terbutaline between the layers of the horse’s skin and observe the horse’s response. Unfortunately, there is no cure for anhidrosis. Horse owners try to manage the disease in many different ways, including alternative approaches such as acupuncture and electrolyte supplementation. Many common sense tactics can help. First of all, your horse may greatly benefit if you can move him to a cooler climate. If not, try cooling the horse with air conditioning, fans, misters and by frequently spraying him with cold water. Exercise the horse during cooler times of day. Get familiar with your horse’s vital signs, so you know what normal is for that particular horse. If your horse must be outside in the heat, be sure he has plenty of water and shade. Is your horse huffing, puffing and suffering from a dry coat? Call us today, so we can test your horse for anhidrosis and come up with ways to manage his condition, if necessary.